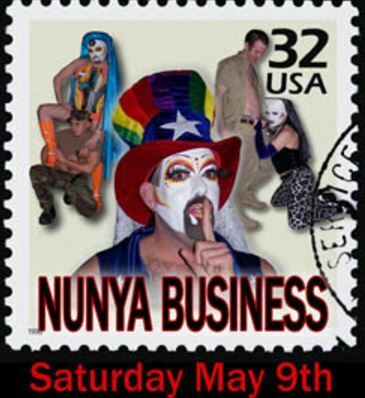 On Saturday May 9th 2009, the Sisters of Perpetual Indulgence held Nunya Business at CC Attle’s. It was a military themed, strip/silent auction to raise money for the Servicemembers Legal Defense Network (SLDN). The SLDN is fighting against the Don’t Ask Don’t Tell policy, and helping our friends and family who are serving in silence. The event was an explosion of camouflage, and glitter. Our models came on stage in some form of military regalia, and left the stage in a smile, knowing that they had done their part to raise some money. If it wasn’t tied down, we auctioned it off…actually we even auctioned a pair of shoes that were tied down. We also had a silent auction table with military gear. We had everything from hats, to bags, to MRE’s, and even an MCU-2P gas mask. There was also an adorable little teddy bear in desert camouflage, that found a new home. If we could get money for it, it went to the highest bidder. 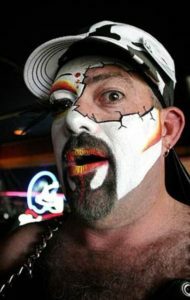 There was an amazing turnout that Saturday afternoon, and CC’s helped get people in the mood with some drink specials. They donated the proceeds of those specials to the cause. Thank you CC’s, we salute you. We were able to raise over $1,000. It is our way to say thank you to all of our friends and family, who are serving, or have served in silence. We salute you as well.